Necropolis is the final book in the Necropolis Trilogy by author Sean Deville. This final chapter continues to follow the effects of the virus as it makes its inexorable spread across the world. With the major continents in ruin, the focus turns to the United States. Rachel and her undead army continue to stay one step ahead of the Overmind until a discovery changes the landscape of not only the cat and mouse game that has been played thus far but also the future of Earth. Necropolis, for me, was a little bit of a disappointment. It literally took me months to read this book and I usually blaze through a novel every three days or so. It felt like the author got lost in the various characters and twists and painted himself into a corner as far as the storyline goes. I mean, there’s only so far the zombie apocalypse can go before everyone is dead, right? Not really a cure for that – or at least not one any author that I have read has imagined yet. To be fair, there was a pretty significant plot twist that totally changed the game so to speak with all the major players, but by the time it occurred, all I could think was “really?”. I know some people will love the twist and I am not going to give anything away but to me, it just felt a tad anticlimactic. Anyway, I loved the first two novels and have said previously in my reviews for both Cobra Z and The Contained that I thought that the author was really doing some interesting and ground-breaking things in the realm of ZA that I haven’t seen before. I’m not too sure why I didn’t really feel the same with Necropolis, but I didn’t. Even the twist was pretty unexpected, but since I have also read novels where the subject of the twist is the main focus maybe that kept it from being such a mind-blowing event. 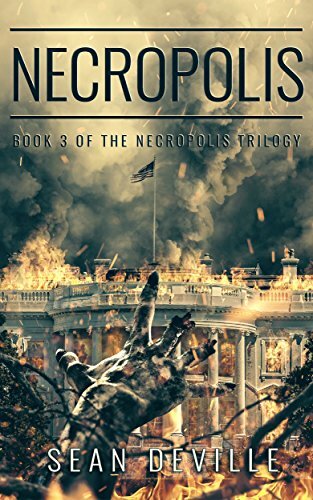 At any rate, if you are looking for a ZA trilogy that is not the usual format, I would recommend the Necropolis trilogy. Maybe you will like the ending better than I did.